Wolf Ridge Ski Resort provides a top rated Snow Sports School that provides lessons for beginners to intermediate in skiing and snowboarding. Wolf Ridge’s instructors are trained to give you the highest quality instruction with your safety as a priority. 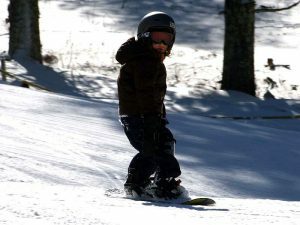 Wolf Ridge’s Snow Sports School offers private and group lessons from 9:00 AM to 3:00 PM and 6:00 PM to 7:00 PM. Private lessons are an opportunity to receive one-on-one instruction which will be tailored to the student’s ability and learning process. Private lessons are taught on an hourly basis and on instructor availability. Private lessons are available for ages 5 and up. Group lessons are for first-time skiers or snowboarders that need basic instruction (how to fall, get up, turn, stop, and ski/snowboard in control). Group lessons are available for ages 8 years old and up. 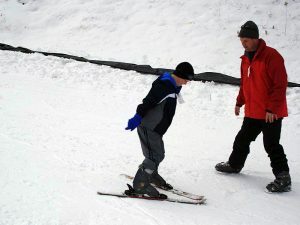 Kids ages 5 and up can take a private lesson and ski one-on-one with Wolf Ridge’s experienced instructors. This is an opportunity for the student to get familiar with the ski equipment and a feel for the mountain. Everyone must have a valid ticket at all times to enter any slope area. Ski & Ride like the Pros! Ski/Snowboard Group Lessons are offered for ages 8 and up every hour on the hour from 9am – 3pm and 6pm – 7pm. Reservations are not available for group lessons. To participate in a group lesson please show up at Ski School 30 minutes prior to the hour. Private lessons are offered for ages 5 and up. Scheduling based upon instructor availability.